MoneyBack Guarantee- Also get 99.9% Uptime Guarantee!! On VPS9 Dedicated Servers and Collocation NO Full Refund will be honored - the 30 day MoneyBack Guarantee does not apply. We reserve the right to refund a Prorated Amount or NO Refund at all. 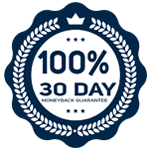 Each of VPS9 managed shared and reseller servers carry a 30 day unconditional money back guarantee on them. If you are not completely satisfied with our services within the first 30 days of your service, you will be given a full refund of the contract amount. Remember, this is only for Monthly VPS and does not apply to Dedicated Servers, Management Services, License Purchased, Administrative Fees, Setup Fees for any addons or Domain Name Purchases. Opening of dispute in paypal, alertpay, moneybookers or charging back through credit card will be not be considered for the 30 day money-back refund policy. One needs to follow the Cancellation Procedure through Client Area and request for the Refund through opening Sales Support Ticket mentioning the reason for Cancellation. The service which as been upgraded within 1st 30days of the purchase does not cover in 30day moneyback guarantee. Billing Department will investigate the request, If found suitable one as per the 30day moneyback guarantee and Terms of Service. Immediate Refund Will be provided within 24-72hours of the working hours. If your Managed or Unmanaged VPS Services has a physical downtime that is not within the 99.9% uptime you may receive one month of credit on your account. Approval of the credit is at the discretion of VPS9 dependent upon justification provided. Third party monitoring service reports may not be used for justification due to a variety of factors including the monitor's network capacity/transit availability. The uptime of the server is defined as the reported uptime from the operating system and the Apache Web Server which may differ from the uptime reported by other individual services. To request a credit, please contact billing@vps9.net with justification. All requests must be made in writing via email or through support ticket. Uptime guarantee only apply to Managed or Unmanaged VPS Services Dedicated servers are covered by a network guarantee in which the credit is prorated for the amount of time the server is down which is not related to our uptime guarantee. VPS9 will not activate new orders or activate new packages for customers who have an outstanding balance with VPS9. For a new order to be setup or a new package to be activated., you need to get registered.